﻿Description: jasmine essential oil (Jasminum officinale): "Jasmine has delicate star shaped sweet, fragrant flowers. In many religions the flower symbolizes hope, happiness and love." Their scent is known to be one of the most exotic. " Jasmine is chiefly cultivated in Asia, the Mediterranean, India and Northern Africa. In China jasmine is known as Moli and the Hindus call it moonlight of the grove. Western cultures use it as an aphrodisiac scent. The Chinese use it to aid nervousness and is known to be a calming essential oil. Jasmine is a Japanese favourite for tea and incense. Jasmine in India was called the Queen of the Night and used for increasing loving feelings and spiritual growth. It is very often used by international and high end perfume companies. "Jasmine flowers are harvested only at night. 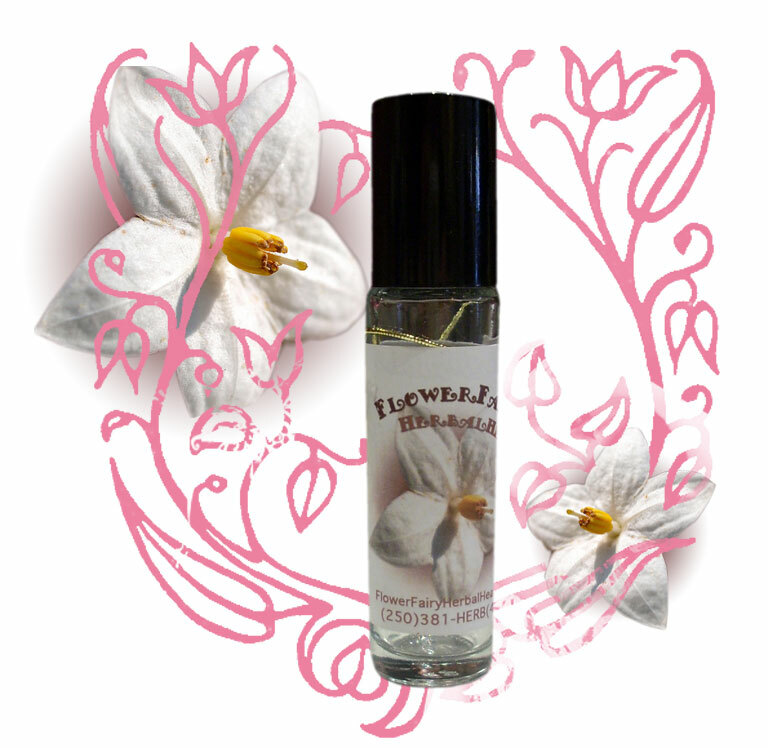 It takes about 1,000 pounds of Jasmine flowers, 3.5 million blossoms to yield 1 once of jasmine essential oil." For these reasons it is one of the most expensive essential oils in the world. It is one of only three essential oils Flower Fairy Herbal Healers use that is a blend of natural and synthetic essential oil of jasmine. This enables the consumer to have access to this normally, unavailable exotic oil. This makes the blend a significantly more accessible. However the natural components and natural properties are still included and thus it is still beneficial in its properties. We are always aware of the source and quality of all our essential oils. CAUTION: Avoid jasmine essential oil in pregnancy & nursing, due to the fact it can bring on menstrual flow. Ingredients: Fresh, Hand-Picked, Home-Grown, Jasmine Flower Heads, & Natural & Fragrance Jasmine Essential Oils, 800 IU Natural Vitamin E Oil, Jojoba Oil, In A Base Cold Pressed Sunflower Seed Oil. In a clear glass roll-on bottle. Shake well before using.